Discussion in 'Muppet Headlines' started by FunnyBear, Feb 2, 2016. 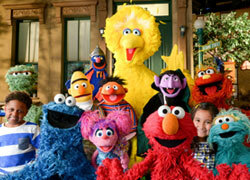 The Muppets among other ABC shows has been nominated for a KCA. 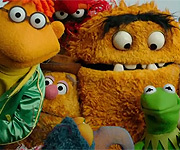 If they win, maybe people will show some respect for Jim Henson and his brilliant mind! Not to mention the notion of entertaining viewers without resorting to the same old shtick and dialogue used in the majority of ABC/NBC/CBS prime time shows today. They just can't take a hint from looking at the shows from the good old days, can they? While I highly doubt that the show will win,i'm still very happy that people are paying attention to the show. Maybe this way more kids will start watching the show. I was surprised to see the show there. Let's hope this wins, as well as Inside Out! I hope that Inside Out wins as well! Inside Out was the best Pixar movie I have ever seen, I cried through the entire thing. I hope they it wins too. Muppet Master, Duke Remington and ploobis like this. Oh wow,that's awesome! I didn't think they would win but they did. If the show was meant to be for adults, how is it nominated for a Kids Choice Award? Well it was advertised as an adult show but it's really more of a family show. "The Muppets return to prime time with a contemporary, documentary-style show that—for the first time ever—will explore the Muppets’ personal lives and relationships, both at home and at work, as well as romances, break-ups, achievements, disappointments, wants and desires; a more adult Muppet show, for kids of all ages." So happy to hear that they won! Maybe after that there is a slight chance of ABC giving it another chance with a second season. But I hate how Spongebob won AGAIN! Granted it was so obviously rigged years ago but around 13 wins in a row is enough. Gravity Falls or Steven Universe deserved to win for best cartoon. Duke Remington and LaRanaRene like this. Yeah, I can't believe Spongebob won again, well I can but, yeah i've suspected that it's been rigged for a long time. I mean come on, The Thundermans won for favorite series,REALLY?!? Okay granted the other shows that were nominated were not the best shows in the world but still,I find Girl Meets World and Henry Danger to be much better shows. The Thundermans seems to have very little effort put into it at all. It does say "winners are determined by voter preferences and other considerations", which is absolute crap. Spongebob only probably wins every year because of the fact it's a Nick show. In fact, the only time it hasn't won in 15 years was to Avatar, which is actually ok, but even then it was still Nick. Gravity Falls deserved to win this year, not only because it ended this year, but it has the most amount of heart I've ever seen put into a cartoon show. However, I am surprised The Muppets actually did win. Maybe the award could be used to persuade the folks over at ABC to renew the series. Pig's Laundry, Duke Remington, LaRanaRene and 1 other person like this. Been saying that for years. Now, I love Spongebob and everything, but it's not even the best cartoon on the network, even currently (there's at least general consensus that Harvey Beaks and TMNT are well done shows). I am by no means surprised that kids who watch the network and vote on the network's shows would hand the award over to the thing that they play pretty much anytime there isn't a preschool show or tween-com on. Though you'd think if that's the case, Alvin and the Chipmunks would probably have won. So, the Muppets winning the award...uh.....Kudos I think? At least it means someone's watching, I guess? I agree with the sentiment that they went out of their way to make the Muppets look like a kiddy franchise by shoehorning in some uncomfortable humor, only for it to get grand acclaim at an awards show for those 13 years and younger. It was getting a little more family friendly about halfway through, you can't deny that. Still, they wanted this show to be their big TV comeback by not trying to look like that one kiddy show on the network's prime time line up. Not that I couldn't see kids watching it, though. Wait, a show that isn't produced by Nick won the KCA? And it's the muppets., of all things?! Holy crap, I think I just saw a flying pig! And scientists will unveil the cures for AIDS and cancer! And Disney's even thinking about releasing an official DVD of Song of the South in the U.S.! So was Modern Family, Once Upon a Time, and Marvel's Agents of Shield.